I love agile development. We use it at Easygenerator to develop our software. It allows us to deliver a new version each week, be in sink with our road map and with our customers. You can apply the lessons learned from agile software development to eLearning development as well. 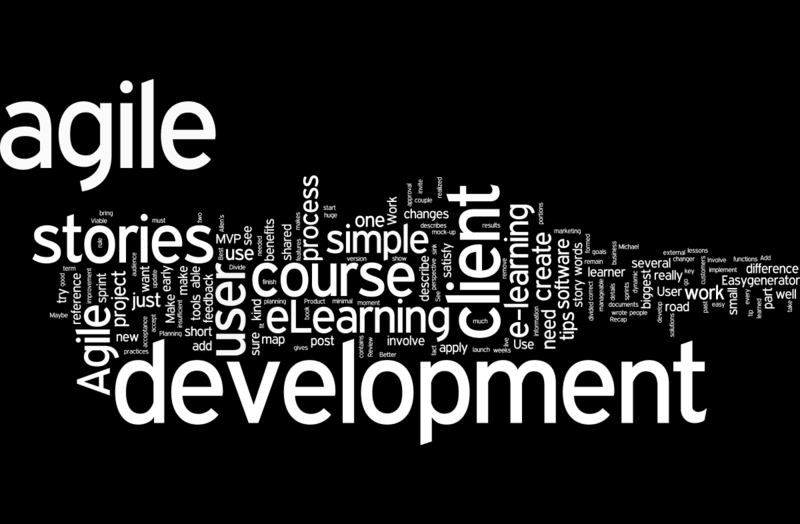 This post contains some simple tips that you can apply to eLearning development. They are simple, you can implement them today and they will make a huge difference. For me one of the biggest benefits of agile development is that you involve your client in the development process, that is what makes the biggest difference. In order to do so you need to have a client. If you create a course for an external customer that is easy. If you create eLearning for your own organization it has to be an internal client. Making sure you have a client is tip 1. The only requirement for a client is that he should be able to accept or reject your results. When you have a client and an eLearning project, the question is how to involve your client into your development process. Agile is made for that. Here are the agile tips that will help you to do just that. Work in short sprints and demo your work! Work in short periods of one or two weeks (called a sprint). Divide your work into small portions so you can finish a part of your project in this period (see user stories). But most important show your work to your client, get his feedback and approval (or his rejection)! Even if you decide not to use my other tips, do this. It is so simple and it will fit in every development methodology and it is a game changer. Just try it and you will see, it changes the whole dynamic of your project. The heart of agile development is formed by the user stories. With an agile process you don’t create all kind of documents that describe the solution from several perspectives, you just create user stories. A user story describes a part of your course from the perspective of a learner. It will describe what the learner is able to do in your course. User stories form the connection between clients and developers, it is their shared reference. A user story must be small enough to be realized within one sprint. This means that larger stories need to be divided into several stories, with the advantage that they remain manageable. User stories will bring you extra benefits as well. Better planning, a simple way of acceptance by your client and more. But just the fact that is gives a shared reference is the key here. See links below if you need more detailed information. When you come up with really new or creative solutions words will be insufficient. Add a mock-up to your user stories. There are very simple tools for this. For our software development we use Balsamiq it creates simple but interactive mock-ups that add a lot to your words. If you want to explain your navigation these kind of tools are very valuable. In marketing there is a term Minimal Viable Product (MVP). A MVP is the launch of a product with sufficient features to satisfy early adopters. In other terms don’t strive for perfection but try to satisfy your early adapters, put your course live the moment that you have reached that point (your minimal viable course). Maybe you can invite a couple of people to take your course and provide you feedback. Tools like Easygenerator have special review functions for this purpose. When your course is out there you will hear what is not correct, what you have to add, remove or change. Make these changes and update your course. Use your audience to define what is really needed and do not go beyond that. The rule is less is better. Previous User generated content; The next trend!